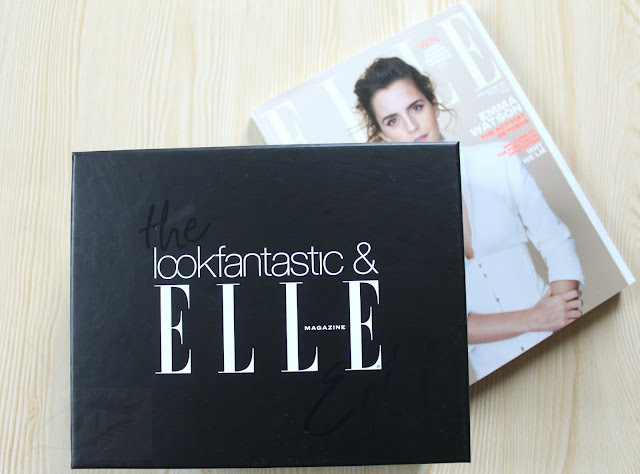 This is my second box from Look Fantastic this year, it's the Elle Magazine Edit. As always, the box comes with a copy of Elle magazine - usually I just dump these (because beauty magazines are just full of crap designed to make us feel bad about our bodies) but I like Emma Watson so I said I'd give it a read. There were 80 pages of ads before the Editor's letter at the start. Then another 6 pages of ads before we got to our horoscopes (mine said I should go globetrotting), then another 18 pages of ads that brought us to a one-page piece about how fashion is feeling at the moment. Then another 36 pages of ads until the next article - so I just gave up, sorry Emma. I will say, if you're someone who likes to use high fashion ads as blog/instagram backgrounds - Elle is the magazine for you. Inside this month's box were six products chosen "to push the boundaries of beauty, to bring you the most exciting products in the industry". I've had these in a beauty box before - they're nice, they're cellulose eye masks that claim to reduce puffiness, fine lines and dark circles. I can't say I noticed any of the above, but as with most of these products, they give a temporary fresh look to the eyes and feel nice. This is a lightweight concealer that promises to eradicate dark circles while giving good coverage. I received the shade 'light', which is still a little dark for me, but it seems nice. I'd compare it to Catrice's Camouflage Cream, it's a very similar consistency and gives similar coverage. A moisturiser for face and neck containing anti-pollution technology and something that helps with pore blocking. This smells really, really strong - like leaves, cucumbers, gardens - it's not completely off-putting but I prefer my facial moisturisers to be less fragranced. It's very lightweight, and feels lovely, but the smell is strong. Apparently this was first seen on the catwalks at London for Spring/Summer 2017 - personally I feel like products of this sort have been around for donkeys years. It can be used alone or over tan - it just gives a shiny look, with tiny particles that catch the light. Not a product that interests me, unfortunately, but if you want shiny skin then you may like it. This is a lightweight facial serum containing rose water and aloe vera, that work together to nourish the skin while healing and hydrating. It smells gorgeous (it smells expensive) and a pea-sized amount is all that's needed, meaning the 30ml tube will last ages. This does leave my skin feeling hydrated and plump, it's a lovely product. This is an innovative hair treatment - gone are the days when we had to boil the kettle to steep a tube of hot oil in a cup, this is a self-heating conditioning mask that begins to heat up when you peel the label back. You use the conditioner as normal after shampooing, just leave it on a little longer then rinse. I used this today - I'll have a mini review on my Instagram later about it. So, overall, when I opened the box I thought - meh. A concealer that probably won't suit me, a tan product, and some skincare. So, it's 50/50 for me on this one - 3 meh products (the Caudalie moisturiser, the leg gloss and the concealer). On the other hand, I was delighted with the Skinchemists serum, eye masks and the hair mask, they're things I really enjoyed but would never have bought for myself - and isn't that the whole point of a beauty box? I'm not entirely sure if everything fits in with the 'innovation' theme - (how innovative is concealer?) - but I'm glad that it's not full of lip gloss and kohl pencils like some other box brands I've tried. Again, I'm looking forward to next month's box already. Verdict: Could do without tan products, but a nice box with some really interesting brands. Some nice products in here. I signed up for the 12 month subscription and this was my first box, which I was delighted with 4 of the 6 products so not bad for my first impression. I've heard there advent calendar at Christmas is amazing? !